I help run a company and I am often amazed at how unaware people are of opportunities that are staring them in the face. I was at a meeting this morning of a group of social entrepreneurs who gather together once a month to share what we are doing, to help each other and to learn from industry experts. At this morning’s meeting one of the social entrepreneurs spoke about her passion for mental health and how she was creating a mental health project for Corporates, but it was a project without funding and without income, which she was going to do from her own home. I saw the Magic of the Moment and spoke to her while in the group, sharing that our training both addressed mental health issues and generated increased profits for companies. I suggested she join me for coffee after the meeting to share ideas and explore possible collaboration. My comment and invitation didn’t even register. She completely missed the magic of the moment. And both she and I lost out. Such lack of awareness is endemic, most certainly among the public at large and even among most entrepreneurs. 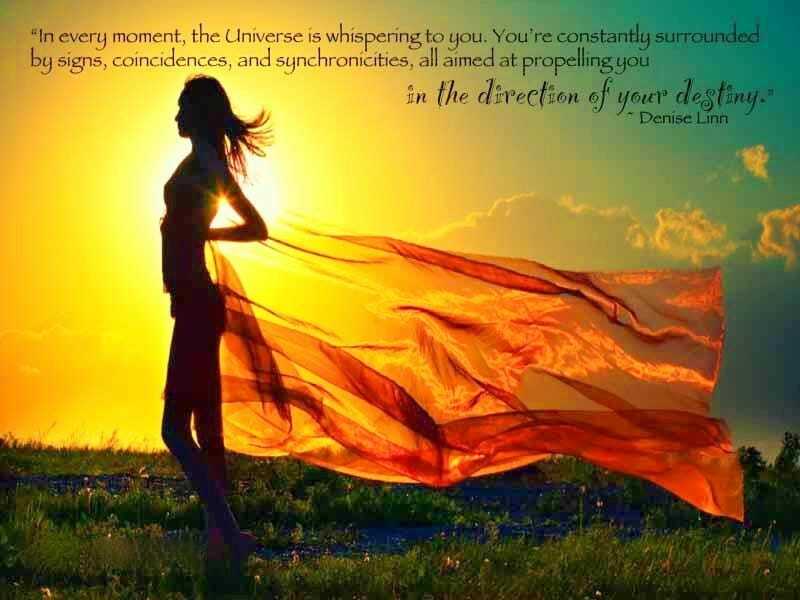 People sometimes say to me that they do not experience signs, coincidences and synchronicities in their lives. The truth is everyone does but most people are completely unaware of them. The truth is that it’s possible to develop a very real intimacy with the Divine and the abundance of help made available, and to do so through the everyday unfolding of your life. So how can you experience the universe communicating with you? First I recommend is you have a vision. A vision that comes from your heart. Second share that vision with the people who are quite naturally assembled in your life. Third be aware of the opportunity when it comes. Fourth act on that opportunity. The fifth and final thing is to be grateful for what you have been given. A vision that comes from your heart is way more powerful than one that comes from your mind. A heart felt vision is supercharged with the energy of compassion, empathy and love. These are the three most powerful forces of attraction in the world. At the same meeting this morning I told the story that to launch our company I booked the best room in the best hotel in Belfast and travelled 100 miles north with my computer which contained the vision I had for our business, a vision that was created from my heart. I gave the presentation to my oldest friend. At the end of the presentation he jumped to his feet and said, “That was the best investment presentation I have ever heard. Do you want me to sign up now?” I left for Dublin that evening with a large investment to launch our business. Visions created from the heart have amazing attractive power. OK, so now we had to build the company and we needed help - a lot of help. I shared our vision with a few people I knew to whom I gave a role and they were very excited to be part of such an inspiring project. They in turn brought another 16 people into the project, each one perfect to fill a required task. I never advertised, or even asked for help. It all happened by itself as if by magic, with one meaningful magical moment following another. One of the key people I had to recruit was our film director. I was having coffee with someone who I knew from a healing group that I was part of. She shared that she had always wanted to be a film director. So I immediately told her about our project and invited her to direct me presenting to camera. I taught her the finer points of how I wanted the directing to work. She took to it like a duck to water - so she joined our team. And she turned out to be one of the two people who brought all the others into the project. During the construction of our company I was approached by another person I knew who wanted to invest. She wanted to invest a small sum and was seeking a higher interest on her term loan than I wanted to pay. But it felt right to me so I took on the additional loan. Now the entire project is complete. It has taken a seven-figure investment. I now realize as I reflect on building our company, that if I hadn’t taken that small loan at the higher interest, we would have gone bankrupt before we could complete. The opportunity came along and I took it, and that is what made the difference between success and failure. Now our company is built I am grateful everyday for what has been achieved. I express this gratitude by buying lunches, and other refreshments out of my own pocket for every one who gets involved. This also helps cement existing friendships and develop new ones - and at Trans4mind we are in business to make friends. So that is how I express my gratitude in a practical way.